Admit it, the digital age has been providing us a lot of distractions that keep us from focusing on the important things and from doing what we should be doing—right now. The digital age, along with the Internet, seems to be quite good at this and has not failed yet. Our productivity has been compromised. Some people say that it is a matter of mental training and building up a huge amount of discipline. If you let yourself be distracted then you will be distracted. There may be lots of tools out there that are useful in increasing the productivity of an individual—however, they are only as effective as the user himself. But, it does help to encourage you to stay focus and be disciplined. Here are the 15 productivity tools that we think might just help you in increasing your productivity. Evernote is an information management application that is both handy and versatile. It used by entrepreneurs, business men/women, bloggers, journalists, and regular people to make their everyday work more productive and to guide them with their tasks and projects. You can use this app to take down notes digitally, save video and audio files, create lists, organize photos, set reminders, upload attachments, and even save or write your own recipes, all synced across all of your devices, from desktop to mobile devices. You can even clip Web articles to store them for later reading using the Ever note’s bookmark let. With Ever note’s profession built-in tools, you will never want to switch back to the traditional ways of creating and keeping your notes. Content production is an essential part of digital marketing. Every now and then, a lot of businesses embrace the process of writing a content on a regular basis to attract more readers and customers. With the increasing demand of content, companies rely on using content calendars to ensure that no days are missed. CoSchedule is one of the best apps to manage the content production of your business. It has a built-in platform where you can keep your content-related task at the best possible performance and at excellent health, ensuring that the content production flows smoothly and seamlessly. 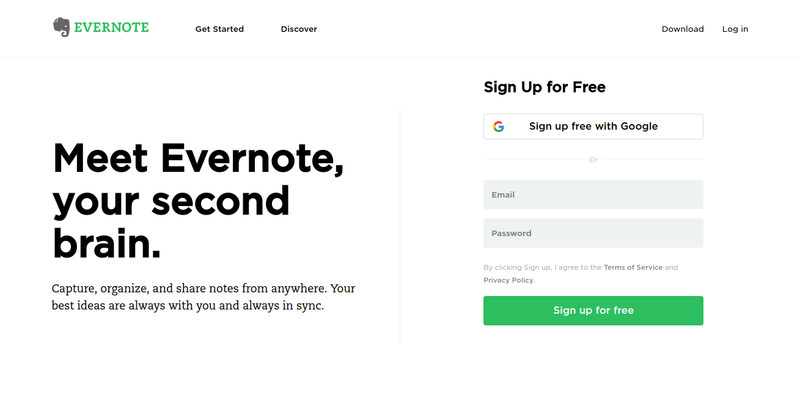 It saves and manages all of your content online, eliminating all the tedious tasks of having to save your written notes to your computer. CoSchedule is not only limited to general content editing, it is also the right platform to use and manage content marketing, social marketing, general marketing, project management, and blog management, all accessible in one single, powerful app. Plus, CoSchedule also integrates with other platforms, such as WordPress, Evernote, Google Chrome, and social media networks to help you streamline the process of creating, editing, and producing content so you can provide and publish good content. IFTTT (stands for “If This, Then That”) is a “recipe” site built for managing and automating everything you do online. It integrates and connects hundreds of various apps and services that you can work together to perform automated tasks based on your needs. For example, Gmail users can use IFTTT to send automatic replies, or you can create a recipe where it automatically uploads all your Instagram photos in your Google Drive or Google Photos. Or you can manage your social media sites by configuring a selection of recipe that lets you send a post to other social media by just posting it on one platform or site alone. Other interesting features of IFTTT is that it lets you create organized meeting agenda, schedule appointments, set custom reminders, categorize your emails, send you notifications, and use IFTTT to store and sync your files across different cloud services so it will be easily accessible. Create awesome integration with no coding required! If you can think it, you can IFTTT it. At least, that what their website says. Issuing an invoice in PDF and billing someone is a lot of complicated process and task, up until now. Hiveage makes everything easy on your part. While your accounting team does all the numbers and figures, you can send invoices to your clients effortlessly and without involving tedious task. Increasing your productivity and at the same time, accurately give your clients the right numbers. Hiveage is one of the best tools out there that does not only perform automated billing request but also modernized the process of managing invoices. It gives you ways to track orders and invoice history to ensure that the right people pay the right amount of money at the right time. Plus, Hiveage also provides you with financial reports that give you the complete information and data to show you how the things are going in your business. A study conducted by Hiveage research team that using their platform, small businesses can expect to save up to 100 hours of work and it makes sense because we know that the manual process is nothing but full of tiresome and unproductive tasks. Found something interesting on the Internet but don’t have the time to read or view it? Well, no more excuses. Pocket is an amazing app that lets you save Web content, such as articles, images, even videos, to check out later. It is more like your personal library where you store all interesting, useful, and insightful stories you find on the Internet. It is very simple to use. You can install an extension on your Web browsers that adds a Pocket button to your toolbar, so whenever you come across an irresistible article or video somewhere on the Internet but lacking the time to dive in, you can just click the button and it will be automatically saved to your library. The best part? You can add keyword tags and descriptions, so you will remember why you saved the link in the first place. Pocket also syncs all your saved links across devices so you can read them anywhere, anytime. You can also let Pocket send you an email every day with the top saved stories as voted by users. This eliminates the effort of having to research your own top stories, thus saving you a lot of time. Every business owner knows how frustrating it is to visit every individual business platform and website just to check and see how the business is doing. It can be very tiresome to sort through dozens of business platforms that you use every day. However, with the launch of Cyfe, everything becomes streamlined, smooth and easy. Cyfe is a digital business platform that lets you organize all your most favorable business tools in a single place. It acts as a business’s data dashboard where everything is placed and can be accessed altogether, be it a number of visitors, AdWords metrics, keyword rankings, or social media success. Cyfe’s platform can link together some of the most prominent business software on the market, such as Google Mail, Paypal, MailChimp, Basecamp, Compete, Klout, Stripe, Shopify, even Facebook and other countless other services—all in a single screen. With all your data in one place, you can have a bigger and clearer picture of how your business is performing. Plus, it is easy for your whole team and yourself to keep track of everything. Need to write professionally? 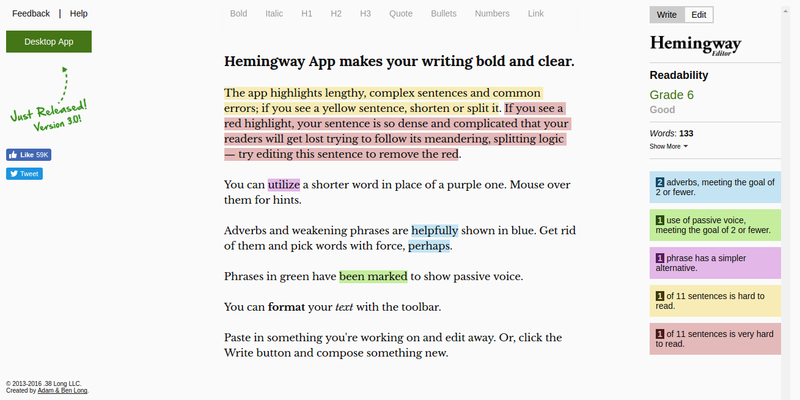 Try out Hemingway editor. It is an online digital tool that checks your writing against common errors, such as grammar, spelling, and poorly written words. It can also capture complicated sentences, the appropriate use of passive and active voice, and the use of right adverbs. Basically, it is a powerful online editing and checking tool which detects writing errors that a common text editor won’t catch. Using this tool, you can write more professional content that the readers would actually be interested to read it. Hemingway Editor has been also helping writers to bring their article writing to the next level. As a business owner, you know how important email marketing is. However, the problem lies on sending an email to a whole bunch of subscribers at once. Most email services and Internet service providers (ISP) limit the emails you can send at one time, to prevent spamming. That is why, in this very hard situation, you need a third party software that can do the job for you, effortlessly. Fortunately, there is MailChimp. MailChimp is one of the most popular and the leading email marketing platforms across the Web where it lets you send an email to an unlimited number of recipients at one time. Their free plan allows you to send an email up to 2,000 recipients, one of the main reasons it is a popular choice. But, not only that, you also have the access to all of the tools of MailChimp. You can design your email newsletters or select a template to make your emails look beautiful. You can share them on social media sites, integrate with the services you already use, and track your results. 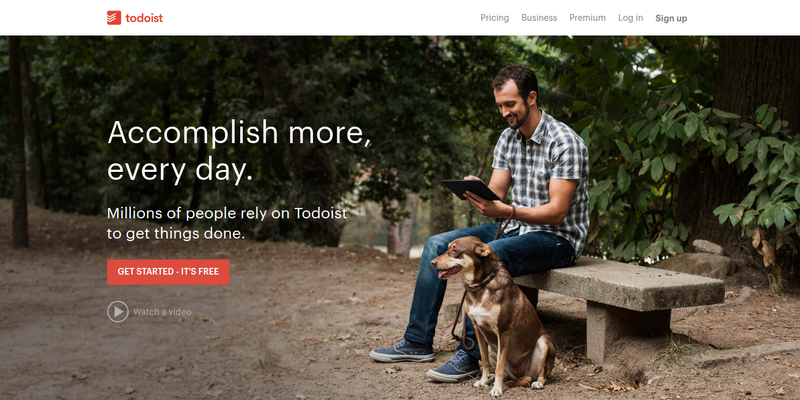 Todoist is also one of the best application for creating a to-do list. They provide an effective to-do list solution for both desktop and mobile users. It is very simple and easy to use with its sleek, modern and minimalistic interface, free from distractions—perfect for creating and keeping a list. Managing and keeping your list is never been this easy. Write them on your desktop computer and access them in the comfort of your own tablet or smartphone device. You can assign each task with colors for increased organization and easy navigation. When you are planning for a work-related trip or tryin to schedule an appointment, you can use the collaboration feature of Todoist and invite others to join the list and share their ideas so you have more ideas to ponder for finding the right solution. With Todoist you can organize and schedule any task and even get yourself a notification every time there is a task that needs to be done on a certain day. You can also expand the ideas on your list using the comments widgets, where you can add photos, videos, and documents that could help finish the ideas. Streak is a CRM (customer relations management) tool developed by Google Chrome, although it can be used across all devices. It is an extension that plugs directly into your Gmail to perform customer relation management right in your browsers. You can use it to categorize your ongoing conversations, send a pre-made email template, provide you notifications when there are important emails and emails that you have not been replied to, and most importantly, give you the ease of sending personalized mass emails. You can also use Streak to create custom sales pipelines that follow an onboarding process, giving you a lot of ways to treat each customer with care and respect. You can also add custom widgets to your work-related email so you will know who you are talking to and what you already know about them. And the part about Streak is that, for anyone who doesn’t like to share their pipelines with anyone, it’s free! RescueTime, from the name itself, literally rescues your time from your bad habits of spending way too much time browsing Facebook, Twitter, and other social media and infotainment distraction sites. RescueTime is a time-tracking tool that enables the user to track their average usage per application and shows you where you usually spend most of your time on the Internet, which can then motivate the users to cut down their time from doing unnecessary things and to be able to get things done. RescueTime also sends you an alert whenever you have reached the limit, which you have set for yourself from spending your time doing a task. It gives you a soft poke, letting you know that it is time for you to take a break or continue doing it tomorrow. It can also block time-wasting websites that you have been spending too much time on, tracks your activity, categorized your projects, and gives you a “productivity score” to show you how you have been doing. You can then compare your scores from daily, weekly, monthly, or even yearly spans. Scoro is a sophisticated and comprehensive solution for work management. It combines all features that are necessary to perform complex project and work management-related tasks, such as calendar management, projects and tasks, contact management, quotes, team collaboration, billing, and reporting. Scoro can also track and provide a full report on the monthly revenue, provide helpful insights about any overdue payments, and gives you an extensive way for managing proposals, events, and tasks that need to be done immediately as it helps you streamlined your entire work progress, reducing the need to use lots of tools for the different tasks. The whole team can also collaborate together to make their workflow as easy as it could be without compromising their regular working schedule. And to make everything easy for your business, Score also provides ways to integrate itself with the most widely used business apps, including MailChimp, Trello, Dropbox, Xero, and others. Trello is a board-style productivity tool that lets you manage and collaborate on projects more effectively. The interface is somewhat similar to Pinterest, where everything is placed on a board-style dashboard. But, instead of being totally photo-centric, Trello lets you create a list, labels, and tasks which you can drag and drop, categorize, tag, and customize with color so you will not find it hard to locate your boards and so you will know which task to prioritize. Trello can have a lot of uses. Some people use it for grocery lists, which I suppose can be very effective, and some people use it for their fast-growing businesses. However, Trello is more popular amongst developer communities that are constantly working on improving their software. Having such an app gives them a more productive work flow. It lets them assign and manage tasks that are currently working in progress and the tasks that have already been finished. 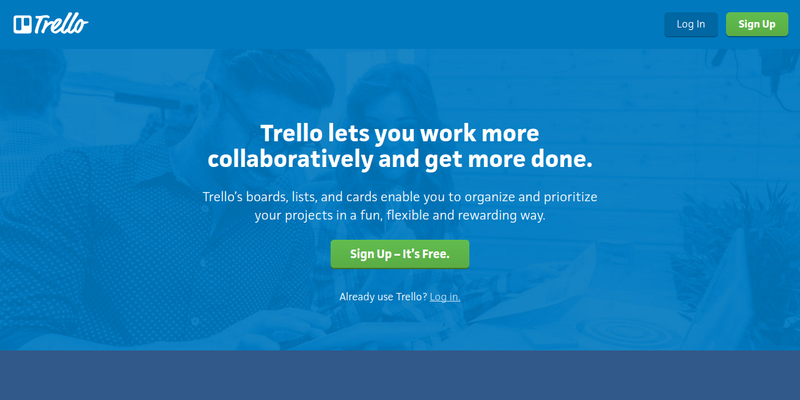 Google, PayPal, Adobe, and others are now using Trello to improve their productivity and performance. That should give you enough reason to use Trello. Trello is available to download for both desktop and mobile devices (iOS, Android, Windows Phone and other devices). When you want to hire the best of the best team for your business, then Betterteam is the perfect tool for that matter. Betterteam is a professional job-seeking platform that lets you publish your job offer for more than a hundred leading job sites on the market. Their streamlined process enables you to create a more sophisticated business profile that can help others understand your business, how it works and what kind of talent your business is specifically looking for. It can guarantee that you will find the best candidate within the next 48 hours. Using Betterteam, you would not go through a lot of processes posting your job offer to different sites individually. Just imagine the time it would take you if you do that. Betterteam is the perfect solution. SEMrush is an all-in-one digital marketing software tool that provides you with a competitive analysis of any of your competitor website in the world. You can use SEMrush to find out what keywords people are searching from them, and once you have the data, you can improve what your business is offering and provide it with more insights and useful information. Using SEMrush, you can get valuable information about your website, including those of your competitor. You can also use SEMrsuh to find out what kind of content is currently trending on the Internet, create a content that your readers would actually want to read and optimize your sites while exploring back link opportunities that could help your website grow.